Analysis of arterial blood gases (ABG) is an essential investigation in the management of critically ill patients as it provides important information about alveolar ventilation, oxygenation, and acid-base balance. Measurement of ABG includes measurement of three parameters, i.e., pH, PaCO2, and PaO2; however, measurement of bicarbonate (HCO3–) and electrolytes is almost always done simultaneously to complete the whole picture of acid-base & electrolyte balance/imbalance. PaCO2 is the best parameter that reflects alveolar ventilation; high (> 44 mm Hg) and low (< 36 mm Hg) PaCO2 levels suggest alveolar hypoventilation and alveolar hyperventilation respectively. The status of oxygenation is affected mainly by PaO2, FiO2, and hemoglobin content along with its affinity and saturation with oxygen. The presence of hypoxemia (PaO2 < 80 mm Hg at sea level while breathing room air) does not necessarily mean the presence of hypoxia. Blood pH is maintained in the narrow range (7.36–7.44) by lungs, kidneys and blood buffers. In general, the blood buffer system (H2CO3/HCO3–) acts within a fraction of seconds, the respiratory system takes about 1–15 minutes, and kidneys may take many minutes to many days to adjust H+ ions concentration. PaCO2 is mainly controlled by lungs and is a marker of respiratory acid-base disturbance. HCO3- is mainly controlled by kidneys and blood buffers, but it does not always purely indicate metabolic acid-base disturbance as it is affected by hydrolysis effect. Plasma bicarbonate can be calculated using the Henderson-Hasselbalch equation; while standard bicarbonate is plasma bicarbonate obtained after blood has been equilibrated at 37°C with a PaCO2 of 40 mm Hg. The difference between the measured bicarbonate and the calculated bicarbonate is known as base excess (if positive value) or base deficit (if negative value). In acidemia, an excess of H+ ions enter intracellular space, hence, K+ ions move out from intracellular space into the plasma to maintain electroneutrality. Thus, acidemia is associated with hyperkalemia. In distal renal tubular cells, K+ or H+ ions are exchanged for Na+ ions. 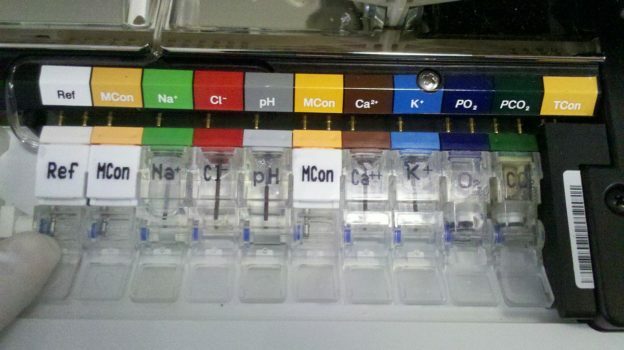 In alkalemia, as H+ ions are retained, K+ ions are exchanged for Na+ ions, leading to hypokalemia. Compensation: In response to primary acid-base disturbance, the respiratory system or kidneys attempt to maintain normal pH by the compensatory response. Compensation “moves the pH towards normal”, but compensation can never “overshoot” the normal pH. 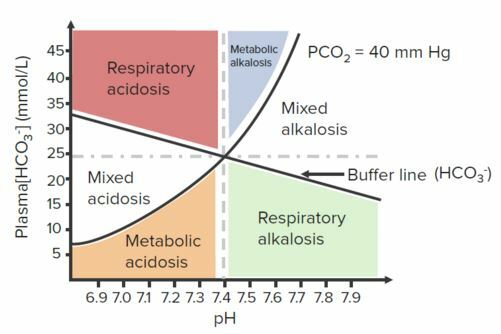 Respiratory compensation for a primary metabolic derangement is immediate and usually improves over the course of hours, while renal compensation for a primary respiratory derangement is gradual and improves over days as it takes time for the kidneys to generate/eliminate HCO3. Causes: Basically, causes of respiratory acidosis are those that cause CO2 retention or hypoventilation. CNS depression due to CNS disorders, opioids, sedatives, etc. Causes: Basically, causes of respiratory alkalosis are those that cause CO2 washout or hyperventilation. Hyperventilation due to pain, anxiety, hysteria, CNS tumor/disorder, pulmonary embolism, etc. Metabolic acidosis is further sub-classified on the basis of anion gap. Step 1: Is there acidemia or alkalemia? For primary metabolic derangement, respiratory compensation is usually immediate and improves over the course of hours. For primary respiratory derangement, renal compensation is usually gradual and improves over days. It also depends on whether the condition is acute or chronic. AG should be corrected for hypoalbuminemia: For every 1 mg/dL below 4 → subtract 3 to the “normal” anion gap. Another important consideration is to calculate ΔAG (change in AG) and ΔHCO3– (change in bicarbonate). 8 mEq of change in HCO3– is accounted for by AG acidosis; additional (14 – 8=) 6 mEq of change in HCO3– must have been caused by non-AG acidosis → combined AG and non-AG acidosis. If urine AG is positive, it implies HCO3– loss by the kidneys as in renal tubular acidosis. If urine AG is negative, it implies HCO3– loss from an external source as in gastrointestinal losses. Refer to causes of acid-base disorders described above and correlate them with the conclusion before making a final diagnosis. 1. 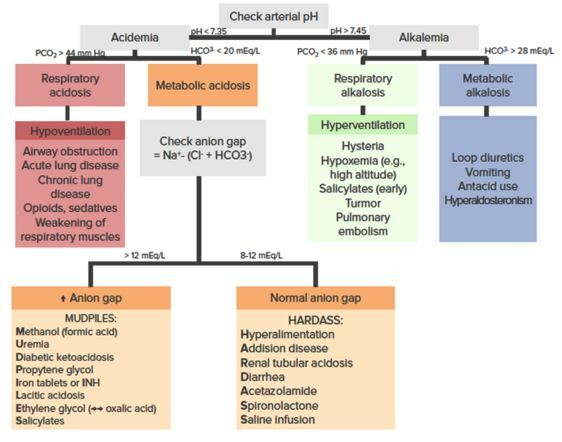 Which of the following is not associated with high anion gap metabolic acidosis? 2. Which of the following conditions is associated with saline-responsive metabolic alkalosis? 3. 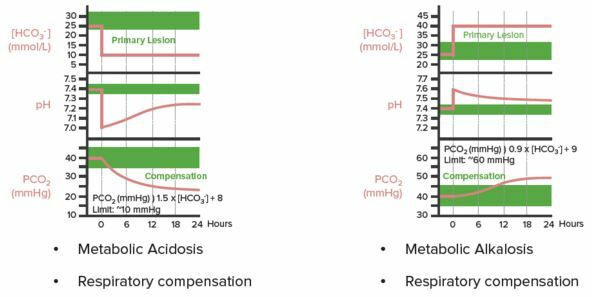 In a patient with metabolic acidosis, anion gap is 22 mEq/L and serum HCO3- is 16 mEq/L. What is the acid-based imbalance? Barthwal MS. Analysis of Arterial Blood Gases – A Comprehensive Approach. JAPI 2004; 52: 573-77. Chung DC. Arterial Blood Gas Interpretation: The Basics. Fraser, Anna, and Yee Ean Ong. “Interpreting arterial blood gases.” (2014). Verma, A. K., & Roach, P. (2010). The interpretation of arterial blood gases. Aust prescr, 33(4), 124-129.